I liked it. I thought it was a solid movie. A good super hero movie for littler kids that you don’t want to expose to the dark, gritty, gore of say the MCU. The movie poked fun at itself, did not take itself too seriously. It reminded me (when he first received his powers and they were trying to find out exactly what that meant) of The Greatest American Hero, that kind of haphazard learning curve. If you wonder why I think it is not a gritty as MCU – well, even the costume is somewhat cartoonistic. It was not like an engineered suit you would see in a movie that hones in on technology. Also, the absence of actual blood or gore in the fight scenes. SPOILER SPOILER SPOILER: There is a scene that involves a conference room with frosted windows. You can see shadows of people but not details. When the fight scene breaks out you can see the various outlines of the board members but not their actual deaths. There is that one shock moment when a body lands against the glass and spooks the receptionist. Had that been MCU or a grittier production team, it would have left a bloody hand print that would slide down the glass, or something to that extent. Even after the fact when the villain is leaving the room, it just looks like the board members are taking naps, laying on the ground, whole and peaceful. I am not saying this is a bad thing. I did not mind it but I did notice it. Again, not horrible just more innocent (for lack of a better term) than “other” super hero movies (both DC and MCU). Another way that it is good for younger audiences, the very apparent lesson to learn on a basic level. A new generation will learn to name the seven deadly sins: Sloth, Wrath, Gluttony, Pride, Lust, Greed and Envy. These are words that they can easily identify as bad traits, in words they can understand and know that these are traits they do not want to have. They give a tangible form to each of those bad traits, sins, and teaches those traits will be their downfall. Unlike the more complex nature of say Infinity War – how overpopulation is a strain on the living and how some measures are too extreme to take. Now if you think I am condoning toddlers going to see this movie – I would say no. The physical form of the deadly sins are scary. There is fighting. And, there are bloodless death scenes (a head is bitten off, but no blood or hanging tendon strands). I thoroughly enjoyed Zachary Levi in this role. I sincerely felt like he was having fun. I liked the theme of family, maybe not the one we are born with but the one we find ourselves in. That you can be friends with your family members and that is ok. You know, I love spoilers. Sometimes I will watch fan theories just to know things. Sometimes I look at iMDB while IN the theater. That is how I knew there were “Shazam Siblings”. They listed them each as Shazam this one and Shazam that one. Now, looking at iMDB they have removed “Shazam” and have added “Super Hero” instead. To not spoil things for others. Lastly, I also like that even the littlest of the siblings, the small girl, can be a super hero too. It was a more feel-good super hero movie. I liked it and I am not ashamed to say so. IMDB Synopsis: We all have a superhero inside us, it just takes a bit of magic to bring it out. 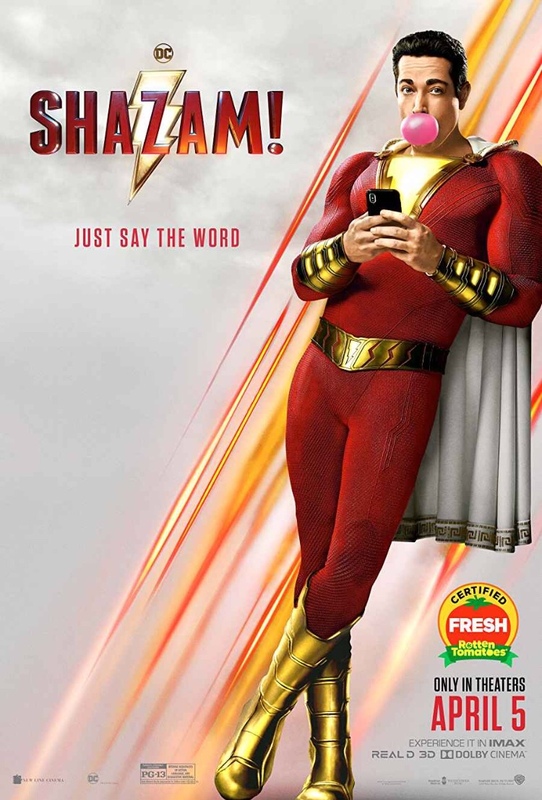 In Billy Batson’s case, by shouting out one word – SHAZAM. – this streetwise fourteen-year-old foster kid can turn into the grown-up superhero Shazam. I rank this movie a 93! It received a Rotten Tomatoes rating of 91% Fresh. It received a Rotten Tomato audience rating of 90% liking it. Average Rating: 4.4/5 with a number of User Ratings: 5,649. Originally, this was going to be one film with Shazam and Black Adam meeting and clashing, but the producers decided to split the film into two origin films for both characters, with Black Adam being its own story set in Ancient Egypt with other heroes. Throughout the film, Billy Batson displays a liking for tigers: he likes stuffed tigers, his backpack has a tiger on it, and as Shazam his cape clasps have tigers on them. This is a homage to Mr Tawky Tawny, a magical tiger who is Captain Marvel’s ally in the comics. hroughout the film, Billy Batson’s superpowered form gets a variety of different names, without getting an official name. This is a homage to the controversy over Captain Marvel’s name; it keeps changing between different titles (Captain Marvel, Shazam, Captain Thunder) due to the issues with rival company Marvel having a similar name as well as a similar hero called Captain Marvel. The skate ramp where Shazam tests his flight has “Arion” written on it. Arion is the name of an immortal Atlantean sorcerer in the comics who’s been both a hero and a villain. Billy’s father is identified by the initials “C.C.”, this comes from Captain Marvel’s original artist C.C. Beck. According to Producer Peter Safran, the film will take place in the DCEU, and he indicated there could be crossover interaction between Shazam! and the Justice League in potential future DCU films. The Annabelle doll from director David F. Sandberg’s Annabelle: Creation (2017) can be seen in a shop window. Both films starred Grace Fulton. After it was announced at a Comic-Con that Brie Larson was cast for Captain Marvel(2019), CNN ran the headline “Shazam! Brie Larson is Captain Marvel”, confusing DC’s superhero with Marvel’s superhero. John Glover, who plays Thaddeus Sivana’s father, has a history in the DC universe as the voice of The Riddler in Batman The Animated Series, Dr. Jason Woodrue in Batman and Robin and as the father to another DC villain, Lionel Luther in Smallville. In one scene, two characters are seen playing a Mortal Kombat video game. The character of Shazam! (under his original name, Captain Marvel) previously appeared in a “Mortal Kombat Vs. DC Universe” video game. At one point adult Billy/Shazam sarcastically says to Doctor Sivana “Gee Whiz, mister!” Shazam (then known as Captain Marvel) first appeared in Whiz comics in 1940. When Envy comes out of Sivana, you can see two cranes that look like thin lit rods in the far distance, one blue and one red. These cranes are currently being used to build the University of Pennsylvania’s new hospital building. Shazam is an acronym formed from the names of the gods that grant powers: (Solomon – Wisdom. Hercules – Strength. Atlas – Stamina. Zeus – Power. Achilles – Courage. Mercury – Speed). The trailer for Shazam conjures up memories of Saturday morning cartoons in the 70s. Shazam was one we never missed. I was pleasantly surprised by the movie. I am glad they did a good job. The sequel is already in the works. I am hoping it lives up to the first movie.